Acculon is plastic coated miniature wire cable. 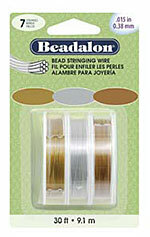 It is excellent for many bead projects and seems nearly indestructible. Great for stringing fire polish beads and others with small holes. We've been joking around the store that this is such an "old school" product when compared to newer materials like Soft Flex, Soft Touch, etc. Nevertheless, it is still a great product with lots of uses. Available in three diameters. 30 foot spools. High quality bead wire in metallic colors. Each spool contains 10 feet for a total of 30 feet per pacakge. Made in USA. A very strong 100% cotton thread. This is nice to use when you want to sew with thread and not imitation sinew. Note that this is far too heavy to use for beadwork. However, it is an excellent size to use for the warp threads on loom beadwork. Sold on an old-time wooden spool. Size #12. Fireline is a pre-waxed, braided cord consisting of gel-spun polyethylene which is one of the strongest fibers, per diameter, ever created. It has an unbelievably high tensile strength and has been recommended in numerous how-to articles on beadworking. 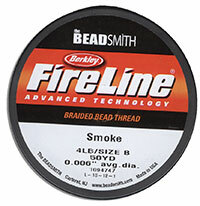 It is manufactured by the Berkley company, which is known for producing fishing line and other supplies. Obviously, fisherman need extremely strong line and this bead thread is a slightly lighter weight than what they produce for the fishing industry. So if this is strong enough to hold a struggling fish, it’s going to be more than strong enough for your beading projects! We carry this in a 4 LB weight which is approximately 0.006 inch in diameter. It’s about the same size as “B” Nymo and will fit a #12 beading needle. Available in Crystal and Smoke Grey. 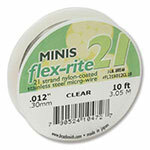 Flex-rite is very fine stainless steel wire coated in clear nylon. It is extremely strong and is excellent for heavy projects or where the beads may abrade the thread. The 21-strand type is more flexible than the 7-strand but less flexible than the 49-strand. The "clear" style allows the silver colored stainless steel wire to be visible.